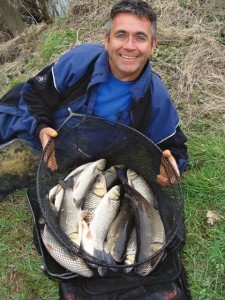 I’ve had some great feedback on my weekly series with Angling Times and it is my intention to visit numerous river venues throughout the UK as the season goes by. If there’s a river near you that you think is worth featuring, please email me to let me know about it and why you think it should be included in the series. To view what I’ve done and where I’ve been so far just click on the links below. You can follow my exploits and those of many other top names who share their secrets to help you catch more fish, every Tuesday, in Angling Times! 5. GET ON THE SMELLY BAITS! 10. ARE YOU HITTING THE MARK? 11. BEAT THEM WITH A TRUNCHEON! 12. BAG UP ON A MISSILE! 30. HERE’S TO A GREAT BACK END! 31. NEW GROUNDBAIT IS A WINNER! 36. KEEP GOING IN WINTER! 37. TRY THE BABY’S HAND! 39. THE £10,000 RIVER MATCH!